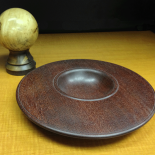 The origin of woodturning dates to around 1300 BC when the Egyptians first developed a two-person lathe. 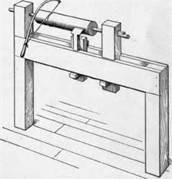 In the Middle Ages a pedal replaced hand-operated turning, freeing both the craftsman’s hands to hold the woodturning tools. 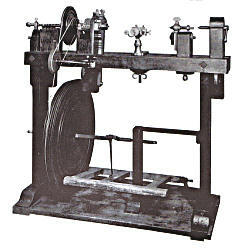 During the Industrial Revolution the lathe was motorized, allowing turned items to be created in less time. 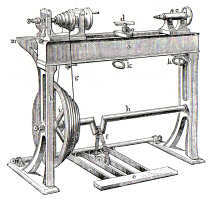 The motor also produced a greater rotational speed for the wood, making it easier to quickly produce high quality work. 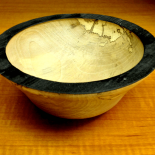 Modern professional woodturners are typically either “production turners” producing large quantities of functional pieces, or “artistic turners” producing smaller numbers of pieces, often enhanced after turning by carving, piercing, coloring, applying pyrography, gilding, or a number of other techniques to produce objects for the art market. Such is the case of mild mannered “artistic turner” Michael Lavergne, employed by Pixus Digital Printing, the leader in digital large-format printing, as its lead Customer Service Specialist. 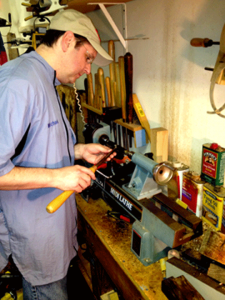 “I saw somebody several years ago using a lathe on TV and it looked like a lot of fun.” Thus the fun began. 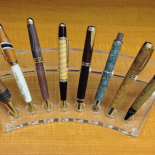 Making custom pens has become an art form for Michael, who makes pen barrels out of wood, bowls, goblets, boxes and has even made a clock. Michael’s wife Donna has not only helped him develop his craft, but is his best critic and inspiration. “It’s kind of like carving, but the wood is doing all the moving for you,” says Lavergne. Michael uses wood found in some of the most unusual places, like tree branches to Bethlehem olive wood which comes from Israel. Finishes vary according to the wood used and range from friction polish, lacquer to cyanoacrylic, better known as super glue. Michael Lavergne has been employed by Pixus Digital Printing for 11 years. As a lead Customer Service Specialist, his responsibilities include: daily account management, creating customer product quotes, start to finish order management, problem solving and maintaining superior customer relationships.